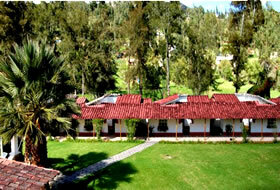 In a privileged place in the countryside of Cajamarca, Av Manco Capac IncaCajamarca Baths 1098 - Peru, in an attractive Andean valley where nature retains its freshness, is the Laguna Seca Hotel and Spa, which offers the convenience of a traditional hacienda. The facilities offer the chance to enjoy good rest and the hot springs flowing from their own fuentes.Hotel & Spa Laguna Seca is one of the few hotels in the world that offers the ability to enjoy a swim in thermal pools in the large installed private rooms each habitación.Las bathroom facilities include outdoor pools, spa pools in every room, Turkish bath with natural steam from the spring and the scent of eucalyptus leaves. The hot spring, their therapeutic and beauty of the surroundings make Hotel & Spa Laguna Seca an ideal place for relaxation and well being in close contact with the service naturaleza.Cada Hotel has been designed and prepared to provide maximum comfort with personal attention and warmth that allows you to enjoy a pleasant stay. All rooms have been designed to provide the necessary rest required guests, each with a private bathroom includes a large pool that allows the enjoyment of geo-thermal waters in an atmosphere of intimacy and comfort. Executive Suite Double Executive Suite Double rooms have two full size beds, minibar, radio, telephone with national and international, air conditioning, cable TV and Wi Fi Internet connection. 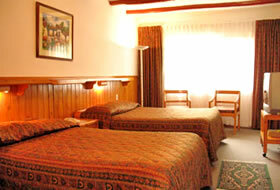 One or two extra beds can be requested in this room. Double Room Executive Suite: Executive Suite Double Rooms have a king size bed, minibar, radio, telephone with national and international, air conditioning, cable TV and Wi Fi Internet connection. One or two extra beds can be requested in this room. Junior Suite Double Junior Suite Double Room has two twin beds and a half, minibar, radio, telephone with national and international, air conditioning, cable TV and Wi Fi Internet connection.Pending additional beds can be requested for this type of room. Double Junior Suite: The Junior Suite Double with king size bed, minibar, radio, telephone with national and international, air conditioning, cable TV and Wi Fi Internet connection. Pending additional beds can be requested for this type of room. Executive Room Double Executive Double room has two single beds and a half, minibar, radio, telephone with national and international, air conditioning, cable TV and Wi Fi Internet connection. Up to two additional beds can be requested in this room. Double Executive Room: The Executive Room Double has a king size bed, minibar, radio, telephone with national and international, air conditioning, cable TV and Wi Fi Internet connection. 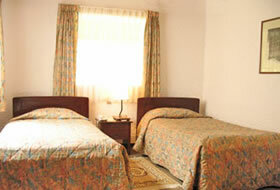 Up to two additional beds can be requested in this room. Double room: The Double rooms have a double bed, minibar, radio, telephone with national and international, air conditioning, cable TV and Wi Fi Internet connection. Double Room: Our double rooms have two single beds and a half, minibar, radio, telephone with national and international, air conditioning, cable TV and Wi Fi Internet connection. Facilities Hotel & Spa Laguna Seca have been widely distinguished as one of the largest in the north of Peru, not only for the quality of their services, but also the ability to combine the thermal product of nature and local culture . 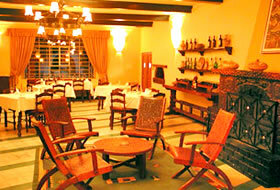 "Restaurant The Campfire" is one of the restaurants most exclusive bar itself Cajamarca. The hallmark of all, found in the art of combining a careful attention to the ability to offer the best of national and international cuisine in a cozy atmosphere. Cafeteria: The ideal place for breakfast with a beautiful view of the countryside. In the morning enjoy your favorite breakfast and afternoon, sandwiches, coffee and a variety of simple dishes. 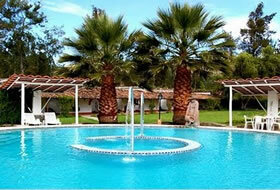 Pools: There are 3 thermal pools temperate spring from "The Tragadero." The first is a circular pool that is located near some of our best rooms, the second a rectangular pool that lies between our Spa and near the restaurant "The Cooker." The third is a children's pool, near the Whirlpool Room. Playground: There are 3 thermal pools temperate spring from "The Tragadero." The first is a circular pool that is located near some of our best rooms, the second a rectangular pool that lies between our Spa and near the restaurant "The Cooker." The third is a children's pool, near the Whirlpool Room. 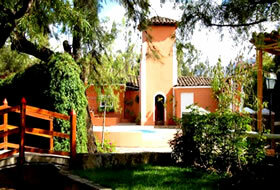 Fundo Laguna Seca: It is the ideal place for visitors who want to get in touch with the work of our farm and nature. It has many of the domesticated animals of the region, such as sheep, horses, ducks, geese, guinea pigs and cows altitude Andean give us milk every morning fresca.Es ideal place for visitors wishing to enter contact with the work of our farm and nature. It has many of the domesticated animals of the region, such as sheep, horses, ducks, geese, guinea pigs and cows high Andes that provide us fresh milk every morning. Stables: The exclusive place of our more than 10 horses the way they have always been part of the appeal of Laguna Seca. It is a good place to learn more about this breed Peruvian horse is considered the "softer over the world." For those interested we can organize the participation in daily tasks, with the saddle, food and daily training. Also offers horseback riding on campus or in Tours for 2 to 3 hours to destinations nearby.It is a fun way to see the surroundings of the Hotel. The department of Cajamarca is located in the north-Andean Peru. Its capital is the city of Cajamarca, located on 2.719 meters, in a beautiful and fertile valley, surrounded by a colorful landscape symphony of green, mild and sunny climate. "Los Baños del Inca" are two hot springs " The Perolitos "giving life to the Baños del Inca Resort, and The Tragadero" which can offer Hotel & Spa Laguna Seca exclusivity in a different environment, especially designed for visitors seeking rest and health.